I didn't watch "American Pie: Reunion" when it came out in theaters for various reasons. For starters, after "American Pie 2", the franchise pretty much went downhill with "American Wedding" (which I was already against before even seeing it coz the original cast wasn't complete) and the straight-to-video spin-offs. I am incredibly happy to announce that they made up for it with Reunion, though. Generally speaking, a high school reunion is meant to be about memories, nostalgia and realizing that we have to move on even if we don't want to. Well, Reunion hits on all of these things perfectly. 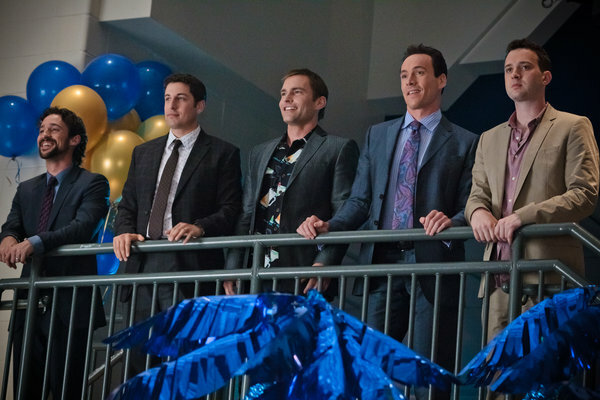 American Pie: Reunion takes place 13 years after they graduate from high school. Although I still have a few years until my own high school reunion(s), I actually grew up with the American Pie gang and therefore found myself intensely immersed in their life stories. I actually almost cried when Jim first walked into his old bedroom and I saw his clunky desktop computer and the corkboard that inspired me to get a corkboard of my own in college. I don't want to give too much away, though, so I'll talk about why I loved the American Pie series so much instead. The first American Pie movie came out in 1999, right before I entered high school. And the second one came out when I was in high school. So, in more ways than one, they prepared me for the international high school and college lifestyle that I was about to experience in Bangkok. Don't get me wrong. I'm not hoping it's the last because it was bad; like for the "Toy Story" trilogy, I'm hoping it's the last because it provides the perfect conclusion to their lives in my mind. Another reason why I loved Reunion is because of how, like the American Pie gang, I have also grown up and can therefore relate to a lot of their 'adult problems'. Jim has a 2-year-old; Kevin still has special feelings for his first love; Oz is still looking for true love; and Finch is scared to admit his faults to his best friends. There are MILFs involved, too, and we all know how I fit into that question. Har de har har. I'm joking, of course. All uncaptioned photos courtesy of Magnavision. Other than that, the soundtrack is also still killer. There are also various special features on this Magnavision DVD, including deleted scenes - which weren't great - and a gag reel, which is cute at best... but then again: which gag reels aren't? If you're going to buy this movie, it should definitely be for the movie itself, not for the special features.